By Sandra Strege-Mims Barr, PhD. Sandra Leads the Ehlers-Danlos Syndrome Local Support Group in Dallas, TX. We will be looking today at the impact that a diagnosis of Ehlers-Danlos Syndrome has on a couple or a family. Most families proceed through day after day earning money from one or two incomes, using that money to pay their bills, and put some into savings – hoping to pay for additional education, to help one or the other of their parents or to put money away for college for the children. Or they use the money to upgrade their living arrangements or save toward buying a house of their own someday. Some put money aside to be able to take a vacation during their off times. Couples usually spend some time together to eat out even if its just for pizza or take an evening to catch a movie. Families can frequently take a weekend together to get out of town or find some activities they can join together to have fun. A broken arm is VISIBLE. You can see what the problem is. Everyone can see what the problem is. There is no question what the problem is. The problem is FINITE. The cast will come off in 6-8 weeks. The person will return to their former state in a predictable length of time. The cast will come off and the person will be able to function as they did before the accident. The problem is FAMILIAR. Everyone knows what a broken arm is. Everyone knows what a cast is. It really doesn’t take a lot of explanation for everyone to understand the problem. 1. EDS is frequently NOT VISIBLE. In fact, people often tell us that it is hard to understand how we can be having so much trouble when we look so healthy. That’s hard for people to put together. 2. And we all know that EDS is NOT FINITE. It is not going to go away. It’s here for the duration! 3. And as for number 3- EDS is far from familiar– Many doctors haven’t even heard of it. Don’t expect your aunts and uncles or the guy in the next office to know what you are talking about. They may not even think that YOU know what you are talking about! So if you expect to get much sympathy and understanding from people who can’t see your problem, who will wait forever for it to go away and aren’t even sure your problem really exists, don’t hold your breath. Getting the Best Medical Care- At a Pediatric Level. If you think it is hard to find a neurologist or other specialist who is familiar or even just open-minded about EDS, there are even fewer of those that work at the pediatric level. You face the challenge of helping your child understand about EDS. And what they will understand will vary according to their age. You want them to understand but you don’t want to overwhelm them either. You also are responsible for helping the family understand– that’s the grandparents and aunts and uncles and cousins- all who want the best for your child and are quite open in offering their opinions. But these too are the people who may be the most reluctant to learn about this new disorder which can be viewed as total fantasy by them. Even from doctors who are unfamiliar with EDS and are unwilling to learn and listen. You are responsible, as with any child, for disciplining this child, something that can be difficult to do when you watch your child struggle with the many challenges they face each day..
You also are the one who needs to enforce the limits that must be placed on the child to protect the child from activities that could harm the child. You get tired of saying “NO”. You don’t want to be seen as the person who always is saying “no” to your child! On the opposite extreme, you are also responsible for encouraging your child; for nurturing the hope and the vision for a future that will include your child and his dreams, especially in light of the limits you know your child will have to live within.. Balancing the focus between enforcing the limits and encouraging the child to hope and dream beyond those limits is an important but difficult task with a child with EDS. Many parents with children with EDS struggle with feelings of guilt– Did I pass this to my child? Am I the cause of my child’s struggles? This is an issue that parents who have EDS will have to come to terms with in order to feel comfortable with their child with EDS. There are a number of factors about EDS that cause stress within a relationship. Frequently, despite all the problems the person may be having, they often may look just fine. EDS is an invisible disorder. The pain and the disability brought about by the disorder do not always stand out on the person. It can be difficult to be empathetic and supportive to a person who does not openly appear to be sick. There is no cure or even a totally agreed upon course of treatment for EDS. When you have as much disagreement among the doctors as to the best course of treatment as you have with EDS, it’s hard for the family to “get behind” the patient and support treatment in a unified manner. EDS is a difficult diagnosis to make. It can take years and cost a lot of money to finally even get that diagnosis of EDS. It’s difficult to support someone having to go from doctor to doctor having one expensive test after another without getting a final and definitive diagnosis. 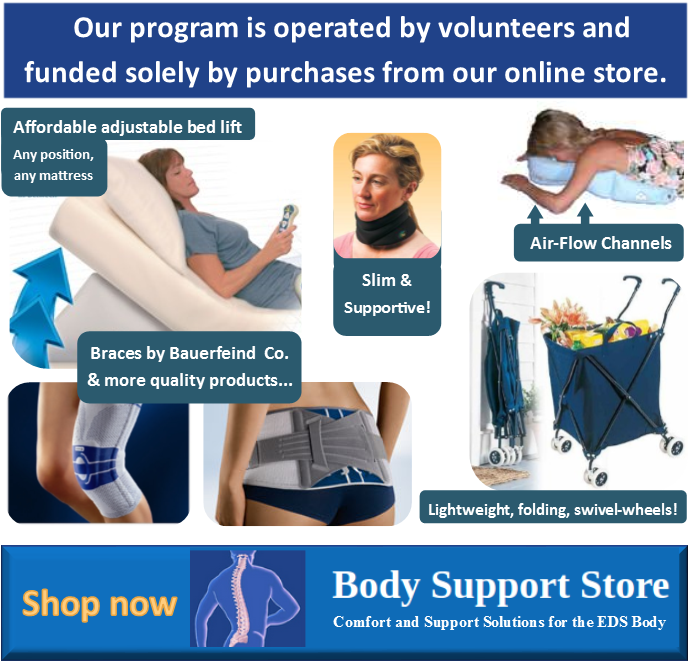 The person with EDS is often in severe pain. People in pain can become irritable, short tempered and not easy to get along with, especially when they are unable to get adequate treatment for their pain. This can be hard on the people around them who are only trying to help but get the brunt of the person’s frustration. 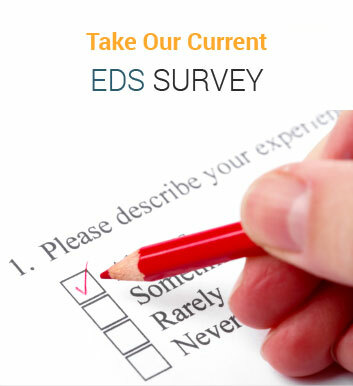 The person with EDS can become physically and emotionally disabled and unable to work. Where once there was a two-income family, you can easily lose one of those incomes to EDS. That, along with the rising medical expenses, can put a very real financial strain on the family. The family often has to give up some or many of the dreams they had for the future. Persons with EDS very frequently become depressed. People who are depressed tend to withdraw from others, can be irritable and become very discouraged and resistant to encouragement from others. Along with that, many people with EDS who are depressed are resistant to seeking help for their depression for fear that getting psychological help will be a signal to everyone that all of their symptoms are just in their heads and are not real. Some people with EDS question whether or not they should have children for fear of passing on the condition to their offspring. Others who already have children question their ability to parent the children they already have. In the case of EDS, everyone has to understand that both partners in a relationship are victims of this disorder. The spouse is as much a victim as is the patient with EDS and this has to be understood by both for the couple to be able to work together as a team dealing with the challenges of this disorder. Both members of the EDS couple must accept that with EDS, the Future is Uncertain. 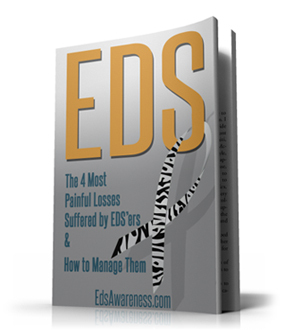 There are many twists and turns on the path with EDS and this unpredictable nature of the disorder will create many surprises and unexpected adjustments along the way.